We had a great time camping in the mountains this past weekend with lots of friends and lots of dogs! I took 500 pictures, but that's a story for another time. I feel most privileged and honored to have been let in on the best-kept camping secret ever by a new friend of ours, and I'm so excited to share it with you now. 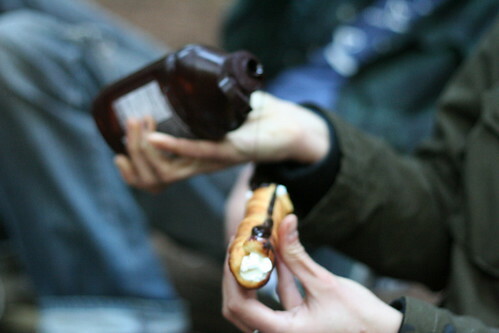 Allow me to introduce...hobo eclairs! So you take a broomstick (clean and unpainted, of course) and rub the end of it generously with a stick of butter. Then take a square of Pillsbury crescent dough (2 perforated triangles together) and wrap it around the end of the broomstick, making sure that the end is sealed. Roast it slowly over the campfire until it's puffy and golden brown. Make sure you don't get engrossed in conversation and let it burn! 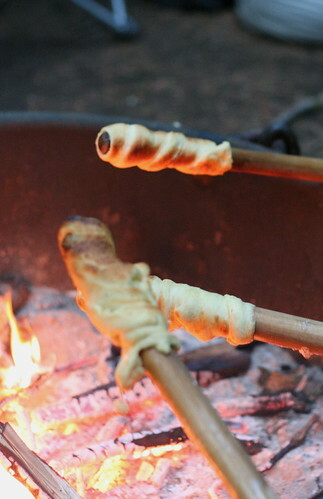 Once it's cooked, let it cool for a minute or so, then slide the cooked dough off the stick. Squirt a healthy dose of whipped cream inside, then drizzle (on top or inside) with chocolate syrup. Genius! We camp every year and my favorite sweet treat over the fire is to roast a marshmallow, then pull it off the stick and poke a hershey's kiss inside it. Yum. But now I'm going to have to try to remember this. I love the whole idea and it sounds yummy too. Oh wow that looks SOOOO good. I gotta try it next time I go camping! Absolutely awesome. I might have to go camping just to try it! WOW! That is brilliant and looks like so much fun!! OMFG this is magical. MAGICAL. This also has the benefit of being vegetarian, unlike most marshmallows. SWEET, dude. I love you for posting this because we are going camping in a couple of weeks! Haha!! 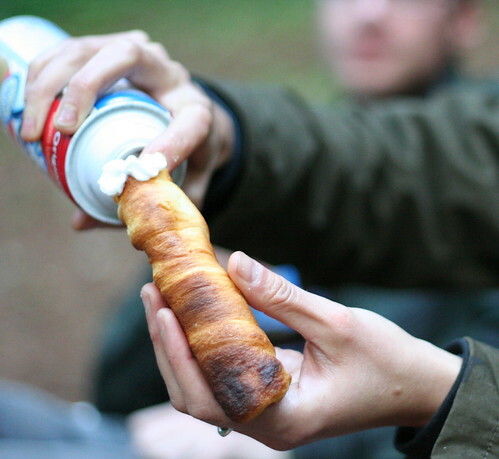 Some good friends of mine make these when we go camping but instead of filling the with whip cream they put pie filling inside, and call them Dough Boys. These win at life, on the basis of the name alone (why does putting 'hobo' in the name appeal to me? I hate to think). Too cute, and so simple! I wish we had crescent dough in the UK, bah. Haha, I love this! What a great idea. I am making these on our next cook out for sure! I have made these before but we used bun dough and filled it with stew. I would never have thought of this dessert version. What a great idea! That is awesome. Hands down, genius quality material here!!!! This is pure creative awesomeness. Yum!! I have never wanted to go camping so bad in my entire life. My my my. Oh my lordy this is the most amazing thing I've ever seen. I want to go camping IMMEDIATELY just to try it out. I was just sent this and will be writing a post about it on my site www.hobodigest.com! This is outrageously awesome! http://wompemsticks.com is way better than broom sticks.